Julie Goodnight has partnered with The Right Horse Initiative to reframe the conversation around horse adoption and shatter the stigma. Every year, hundreds of thousands of horses transition to new owners or careers, and a growing number of these horses end up at risk of inhumane treatment. Julie Goodnight is an industry professional working with The Right Horse Initiative to promote horse adoption and strengthen the horse and human bond. The goal of this initiative is to massively increase successful adoptions of horses in transition and find good people for good horses. Led by the WaterShed Animal Fund, The Right Horse Initiative unifies horse industry professionals, equine welfare advocates, and the broader horse loving public to improve the lives of horses in transition. Julie Goodnight is an industry professional working with The Right Horse Initiative to promote horse adoption and strengthen the bond between horses and humans. Goodnight has spent her career helping horses and humans connect through her TV show Horse Master with Julie Goodnight, horsemanship clinics around the country, and online educational resources for horse owners and trainers. She has worked with hundreds of adopted horses at her clinics and in her TV show and she is passionate about equine welfare and promoting adoption. This unique partnership with The Right Horse Initiative commits the time, talent, and resources to promote horse adoption through education, training, and public awareness on a national level. 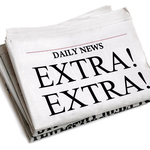 Together partners will work to achieve the goal to massively increase horse adoptions nationwide. As a partner in The Right Horse Initiative, Julie Goodnight is proud to support a national movement reframing the conversation about equine adoption. To learn more about The Right Horse Initiative, visit the righthorse.org. Julie Goodnight established a connection with horses at a young age and after a successful run as a youth rider on jumping horses, she galloped her way through college riding race horses. For nearly four decades, she’s been at home in the Colorado Rockies, pursuing wilderness sports and riding cow-horses. 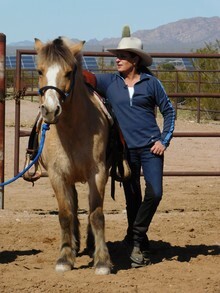 Founding her training business in 1985, Julie’s reputation as a horse trainer grew far and wide. 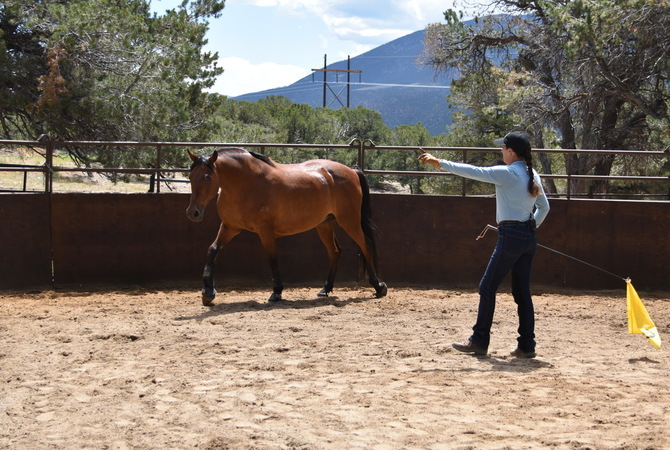 In 2008, she began producing Horse Master with Julie Goodnight, a popular how-to horse training series that has aired weekly on RFD-TV for more than a decade, with 260 episodes. She now travels the world to produce compelling horse TV and educates horse owners everywhere through her online training programs at JulieGoodnight.com.